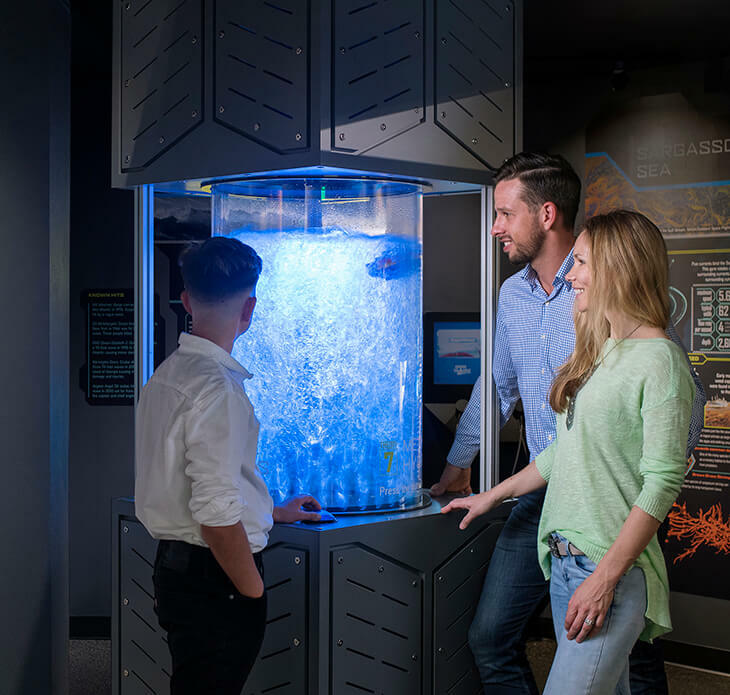 BUEI’s Ocean Discovery Centre is designed to enlighten visitors and locals alike as it ‘unlocks the secrets’ of the mysterious phenomenon that is The Bermuda Triangle. From the earliest recording made by Christopher Columbus in 1492 to the most recent missing vessel in 1991, countless ships and aircrafts have strangely disappeared into the Ocean’s abyss without a trace … but why? What was the cause? Well, that’s for you to decide, and you’re advised not to make up your mind until you’ve digested the whole exhibit from start to finish. 13 theories are presented in this exhibit, and as I tour it for the very first time, scanning the walls intently, I’m impressed to see that they haven’t discarded any possibility, now matter how crazy or seemingly illogical. 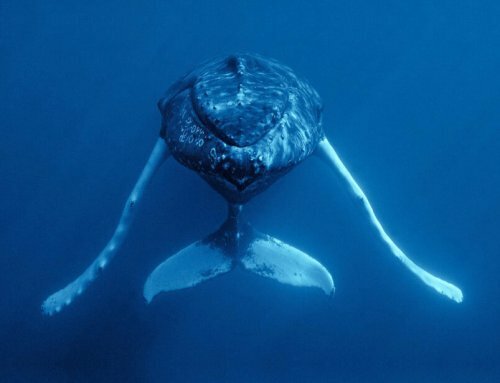 Aliens, Sea Monsters, even the Lost City of Atlantis are considered amongst the thirteen theories (with evidence to back up the claims), as well as a number of more logical reasons based in science; like methane gas hydrates that rise from the bottom of the ocean, rogue waves, the Sargasso Sea and Human Error. 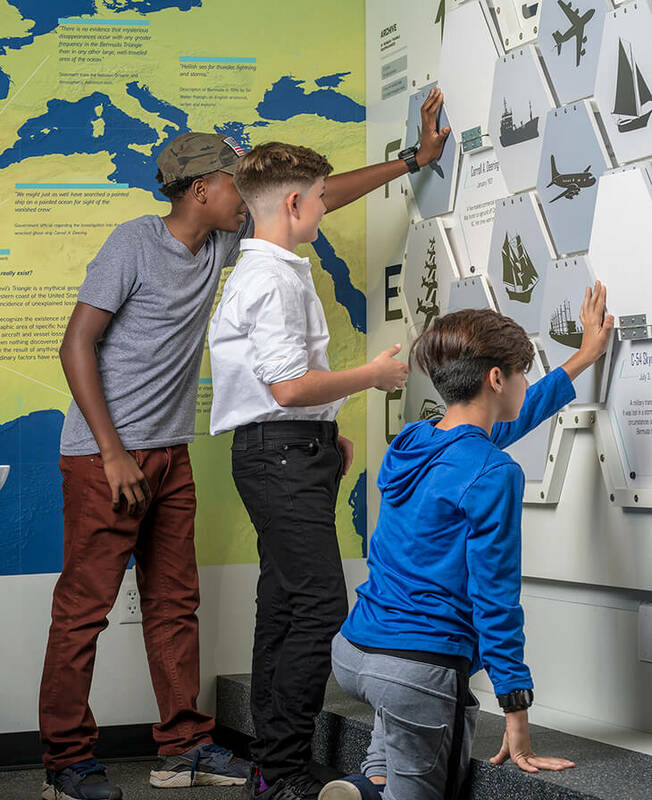 The exhibit was built to be a living classroom and free admission is open to all of Bermuda’s school students, in an effort to better equip them with knowledge of the Bermuda triangle, so they can explain the phenomena when travelling abroad or meeting people from overseas. Designed by local talent Lana Leksina in collaboration with Canadian exhibit design firm 3DS/ THREE DIMENSIONAL SERVICES INC., it’s the very first exhibit of its kind. “In the past there wasn’t a single point where one could learn more about the infamous Triangle, and where better to have an exhibit on the Bermuda Triangle then in Bermuda?” said the Museum’s former director in a press release when the exhibit opened last year. The exhibit purportedly everything that has ever happened or been written about the Bermuda Triangle, purportedly. 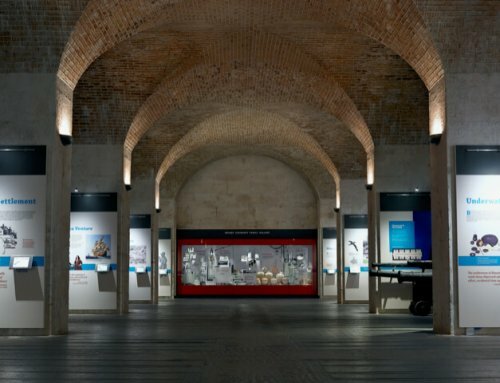 It will also remain permanently on display as the museum promises to keep adding to the exhibit, as they find more information. The experience starts with a simulated dive into the depths of the Atlantic Ocean, once you step inside there’s a number of techy highlights including a 3D hologram of a Hurricane from start to dissipation, a futuristic multi-user touch screen that visitors can use to learn more about every vessel recorded to have disappeared, and a Selfie Station at the end, where you decide what theory to use as the backdrop for a photo which will be emailed to you. 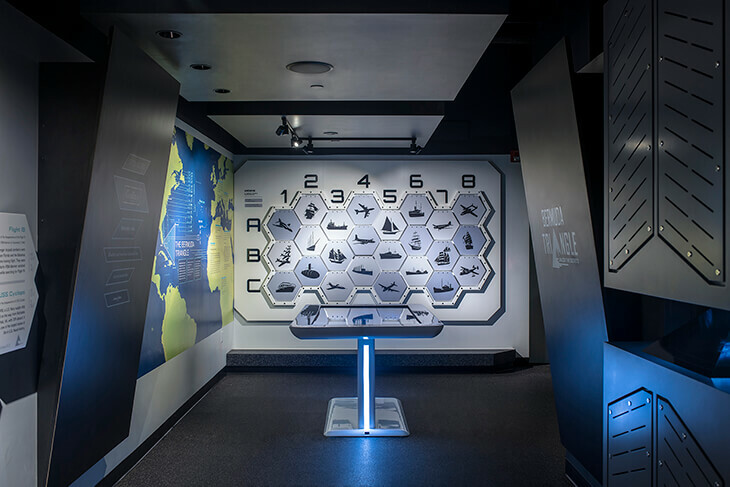 A pop culture display within the exhibit shows a 20-minute video compilation of every time the Bermuda Triangle was mentioned in a TV-show, Film or cartoon – highlighting the massive global interest in this enigmatic topic, said to be the greatest unsolved mystery of the modern age. A giant glass cylinder demonstrates how a large release of methane gas can sink a ship. 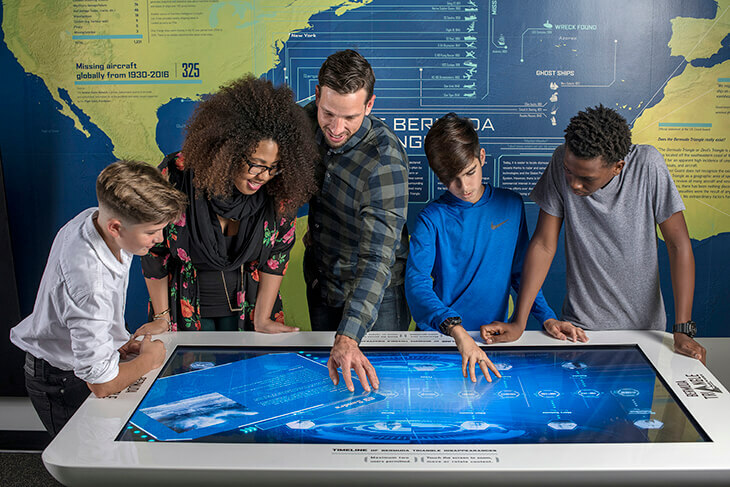 A multi-user touch screen allows visitors to learn more about each vessel to go missing in The Bermuda Triangle. a 15 minute walk from the Hamilton Ferry Terminal!